“You should let me stay at your place, just for a night. In the vinyl era (Indeed, I experienced those days as well) you could purchase an extended version of a single. The so-called maxi-single. Sometimes you were surprised by the extended version of the single because not so bad sounding variations were added in an artistic way. However, in most cases it was just a miserable elongated version with unnecessary repetitions and tedious long intros and outros. The final feeling was more like a slight disappointment and a sudden realization that the music industry tricked you again and took away your laboriously saved money in a shrewd way. A maxi-single wasn’t a guarantee that a sublime sounding music tune would sound even more impressive. I have the same feeling about “Lights out“. The short film (this movie is based on) went viral on You Tube and reached a very high level in terms of originality and entertainment. This version is nothing more than a stretched version with the same phenomenon repeating itself over and over again. And that’s an entity which is only visible when the lights go out. And believe me, there are a lot of non-functioning lights or incidents in which the lights suddenly stop functioning. An irritating number of times. People don’t feel at ease in the dark instinctively. Children and even adults are afraid in the dark sometimes. That’s a form of self-protection. Protection against the unknown and against taking any risks. And that uneasy feeling is exploited in “Lights out” thoroughly. And the fact that the threat can be eliminated again and again by making use of a light source, is a unique feature that can be used in an interesting way. Sadly enough, the mystery and the origin of the creature is being revealed already early. No surprise anymore and less excitement. The only thing remaining in this typical horror are the acting and the use of jump scares. And fortunately this wasn’t so bad. Most horrors fail in this area as well. They try to scare you by showing scary or terrible, gory incidents. 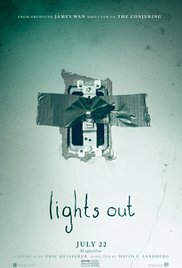 “Lights out” tries to instill fear by using that what you can’t see. You don’t need to wait long in this movie before the scary events start. Before you know it, you’re witnessing how this scary-looking creature wanders in the darkness and makes its first victim. A warning for heart patients. This first confrontation could result in a heart failure. And believe me, such frightening moments will occur frequently. This thing that dwells in the dark, looks extremely creepy and made me think of the phenomenon that could be admired in “Mama“. The next victims could be the young boy Martin (Gabriel Bateman), who still lives with his mentally unstable mother Sophie (Maria Bello), and his older sister Rebecca (Teresa Palmer) who apparently faced the same appearance in the past and therefore left home. In some way, there is a connection between the entity and Rebecca. A kind of materialized delusion that exists solely because of the depressive moods and the delusional state of the insane mother. That’s why it acts so aggressively towards persons that could disturb that relationship. Well, maybe I’m wrong but I thought this was the explanation of it all. As mentioned earlier, at times it’s really exciting and the movie will scare the wits out of you. The story as a whole is a bit of a setback and farfetched. As I read somewhere on the Internet: “The script can basically be summed up as The babadook but dumb“. No complains about the acting though. The three main characters deliver a brilliant performance. Unfortunately, despite the original concept, they still used some predictable and weak options (such as a filing cabinet located in the basement with all the answers to hard questions being found). Sadly this feature film lacks the finesse of the short film. So, it isn’t really innovative. But it’s still entertaining enough.